Pickleball is one of the fastest growing sports for a reason – it is fun, exhilarating, and can also improve your fitness levels. But beyond that, you don’t need to be an expert player or have Olympic-level athleticism to play. All it takes is a few pieces of equipment and the desire to play to get started. The equipment demands of pickleball are light, meaning you won’t need to break your budget to play. A net, paddles, and balls are the minimum requirements to get going with the sport. While sport-specific pickleball shoes and shirts are available, your regular sneakers and a t-shirt are probably fine to start. While you can get the gear you need piecemeal, many people are looking for a complete pickleball set that will give them everything they need in one shot. That is where this guide comes in – we review the top pickleball sets available, to help you find the best set for your money. 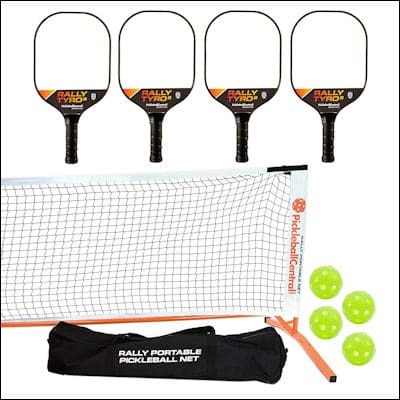 This is a complete pickleball set that will enable you to take your game on the road. It has high performance paddles and a very popular 3.0 Pickleball Tournament Net System from Pickle-Ball, Inc. With its lightweight and portable features, you’ll be serving with the best of them. 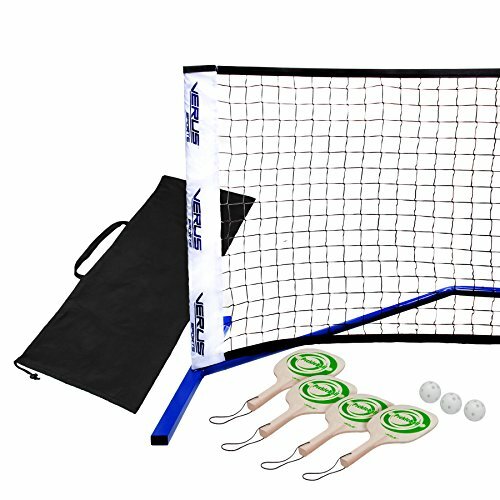 It’s a well rounded, sturdy set that provides you with the Rally Portable Net System, four lightweight Rally Tyro 2 Paddles and four of the green Jugs Indoor balls. New players who are looking to get stuck into their fitness and want something new will love this set. The paddles are made with smaller grips, which allows children to handle them easily as well as adults with joint troubles. There is a slightly textured face and this can help put a spin on the balls, and there’s a lesser jolt for impact, because the shock absorbent core reduces it. There’s a complete frame and net in a carry case with paddles and balls – weighing just 26lbs., and the whole system is incredibly durable, making for easy play in windy conditions. You can set it up easily and quickly, and this Pickleball set is going to be everything you need. With no more water and sand filled bases and an adjustable net height, you can have the pickleball set that hits the ground running. Everything you need to start your new pickleball competition life starts now, and at an affordable price. Any player of any experience will get a great start with this system, and the four Rally Meisters are sturdy, lightweight and has a comfortable medium grip. This is a complete set that enables you and your friends to enjoy a social afternoon together outside and in the fresh air. 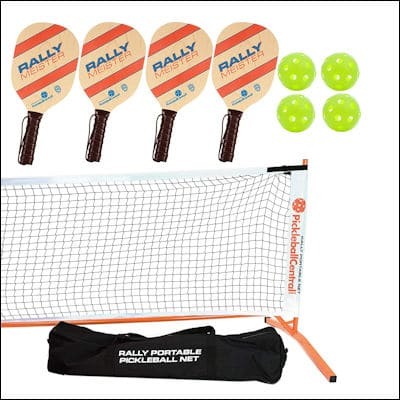 It comes with metal frame, net, 4 Rally Meister wood paddles, 4 jugs pickleballs, rules of play, sturdy carry case with pockets and it’s a high quality net system. The set up is easy, with a snap together metal frame and the top of the net stays taut thanks to the buckle fasteners, and the net stands solid on a power-coated steel frame and strong legs, making it stable and secure. The easy net tension straps and a raised cross bar make play easy, and the Jugs Indoor Balls that come with it are popular as they are soft plastic with a high bounce. Players of any age will love getting together to play, and the included rule book means that play has never been easier. 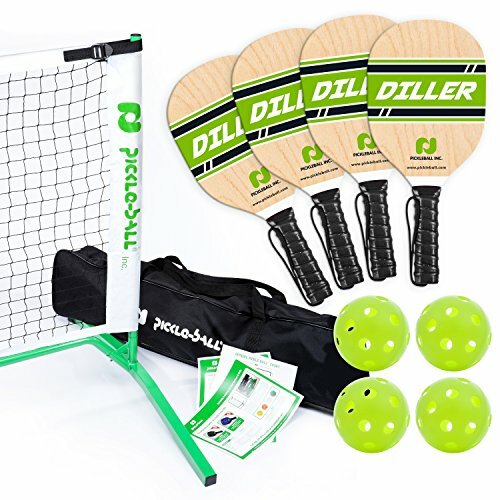 This pickleball equipment set is the perfect way to get started with everything that you need. The set itself comes with four Diller Wood Pickleball Paddles, a Portable 3.0 Tournament Net System and four green Jugs Indoor Pickleballs. The paddles are the most popular around, as they are extremely durable and each paddle is cut from high quality, seven layer plywood. It’s then finished with a clear coat. The paddles themselves are heavy, weighing in between 9-10.6oz. All you need is a hard playing surface – indoor or outdoor – and enough space to accommodate a pickleball court. There is a top notch portable net system, which allows for a lightweight system that can be set up in under eight minutes. The net is adjustable in height and is made of black mesh, with white mesh lining around the edges. The buckle system helps to decrease the tension of the net and allows you to set it up just right. Perfect for a recreation center, school or a pickleball-loving group that gathers in the park, this is everything you need to begin your play. Yet another set that is packed to the rafters with the perfect equipment to set you and your friends up for the newest Saturday night tournament you’re going to take on. 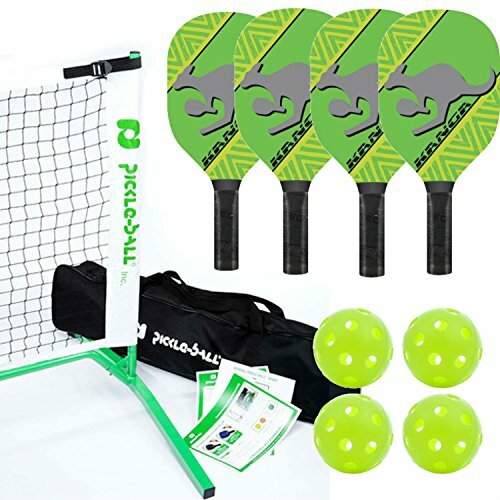 It’s affordable, so it’s perfect for all the family, and you’ll find yourself bouncing up at the net in attempt to slam home the point, just like the kangaroo mascot across the equipment. In this set, you get 4 Kanga Wood paddles, 4 green Jugs indoor balls and a portable, lightweight net system. The paddles are lightweight for wood paddles, which allows for excellent handling and a grip that will comfortably fit against your hand. The Jugs balls are some of the most popular around, so you know that you’re getting quality in this set. This package sets up in less than 5 minutes – meaning more play time for you and the whole family. It also comes complete with a nylon carry case with handles for easy portability, so when you unpack and pack up before and after games, you won’t be standing around waiting for long. The actual net has a powder coated steel frame for longevity and the high quality black mesh net is adjustable in height. It’s been made to offer an attractive set to those who are new to pickleball, and with a top quality net such as this, you can use it for years down the line. This is a professional portable pickleball set, and it’s the perfect pickleball equipment set for the serious player. You can bring it to your local court or just set up in the front yard. With a unique color design, it’s unlike any other on the market today. The new frame design can be set up and broken down in minutes, and the sturdy, triple base frame makes it a secure option in the outdoor weather. The net itself measures 22’x3’ and it meets the IPF specifications required for professional play. There is a push button locking system, which makes for fast and easy assembly when you want to play so there’s no waiting around. For extra efficiency, there is a carry case – which is included – to hold the wooden paddles and pickleballs that are also included. Hopefully our review of these equipment bundles has been helpful in making a decision for a high-quality pickleball set. In our opinion all of the items above will give you a good starting point in the game of pickleball. And if you are new to the game don’t be daunted – it is important to remember that pickleball can be enjoyed by players of all ages and levels of skill. Most people have heard of it but to really understand what it is, it helps to know exactly what pickleball is! It’s a paddle sport that takes pieces of tennis, badminton and ping-pong and turns it into a game with a paddle board and a plastic ball with holes. The game is right for people of any age, though it’s particularly popular among seniors. The rules are simple, which is why it’s such a great sport to introduce people. It’s a challenge, it’s fast and it’s a competitive game when more than two people are playing. Why Is It Popular With Seniors? Social Aspect – A pickleball court is smaller than a normal tennis court. To put it into perspective, you can put four pickleball courts into one tennis court! Gameplay allows the players to be near enough to engage in conversation and if you want to have fun with people and really be social in your sport, pickleball makes it easy. Coordination – Pickleball, like other racket sports, requires a pickleball paddle set, which helps you to improve your hand-eye coordination. As we age, this is as vital as any other daily exercise in which we take part. The exercises that you do during a pickleball game can also help you with balance, which is a big deal for those with advanced age. Health – Racket sports like pickleball boosts your cardiovascular system and prevents issues such as stroke, hypertension and heart attacks. It’s a great aerobic workout and it doesn’t put too much strain on the joints. The senior age group became attracted to pickleball because it’s an easy, social game to play that doesn’t require too much pain after a workout. It’s also popular with former tennis players who can no longer handle the pressure of the game. So many people choose to buy pickleball equipment over a pickleball paddle alone, but that set is still going to have a paddle in it. The thing is, most people choose a set because of the price, and while it’s important to stick to your budget, price won’t give you the entire answer as to whether the paddle is any good. Just because something is pricey, it doesn’t make it the best option. When it comes down to it, weight is the most important priority for buying a pickleball paddle set. They weigh in between 6 and 14 ounces, and while a few ounces won’t seem like much of a difference, it will determine the feel of the paddle in your hand and your ability to swing it. Heavier paddles are the easiest way to make your shots more powerful, so if you want to increase the force of your drive, you need a heavier paddle to work with. To improve aim, you want a lighter paddle. Once you have settled on the right paddle weight, you need to consider the grip size. You need to be able to pick up a paddle that has the correct grip circumference that matches the size of your hand. If you don’t choose the right size, it’s like running in shoes that don’t fit you properly. Those with more wrist action need a smaller grip, and this allows for more control. Increasing your stroke stability means finding a larger grip but you don’t want to use a grip that’s too large for your hand, either, otherwise you will end up with elbow strain. Edgeless pickleball paddles – a lack of guard that usually protrudes slightly around the edge of the paddle. The guard prevents chipping if it’s banged, but serious players choose edgeless paddles for a bigger playing surface. Wide body paddles – regulations for official pickleball paddles is based on the length x the widest width and should never exceed 24”. Elongated paddle – the current most popular paddle. It’s a longer, thinner paddle surface and now every major brand is competing with it. The best way that you can choose pickleball equipment is to try a few and see how they feel. Different weights, different materials and different shapes work for people in different ways, and doing this can mean that you get the right paddle for your gameplay. Choosing the right pickleball equipment sets doesn’t have to be difficult for you, because while it seems like there is too much choice out there, it comes down to whether you know what is going to give you a great game every time that you play. It’s the fastest growing, social game in the US – choosing the right pickleball sets will make sure that you have the best time while you play. 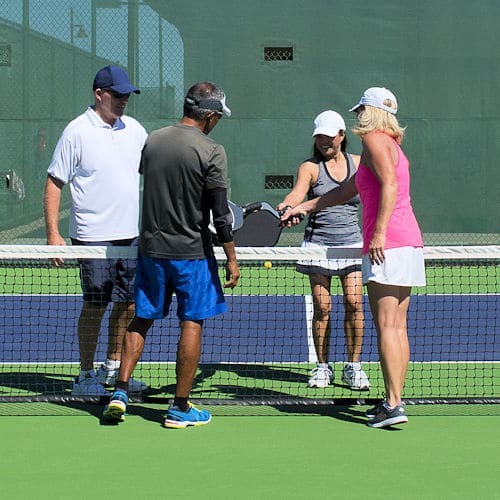 Whether you are a seasoned pickleball pro or a newbie just starting out, we are confident the choices above will get you started on the right foot. So don’t let analysis paralysis set in – pick an equipment set and get started on your own pickleball journey!